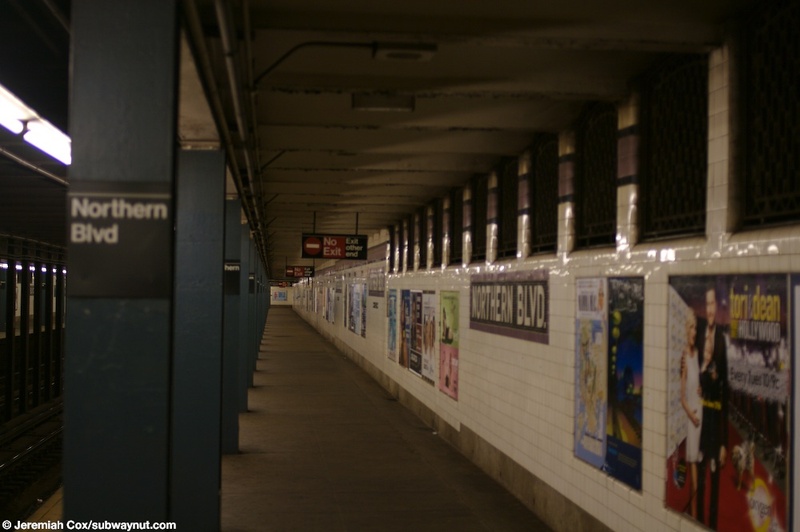 46h Street is a simple Queens Blvd Line Local Station. 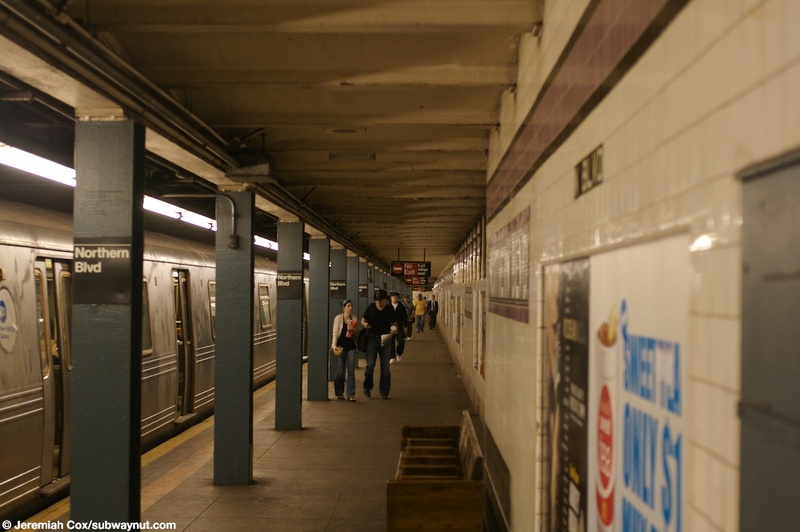 There are only two tracks in the station, the express tracks have left the local tracks to take their more direct route towards Queens Plaza. 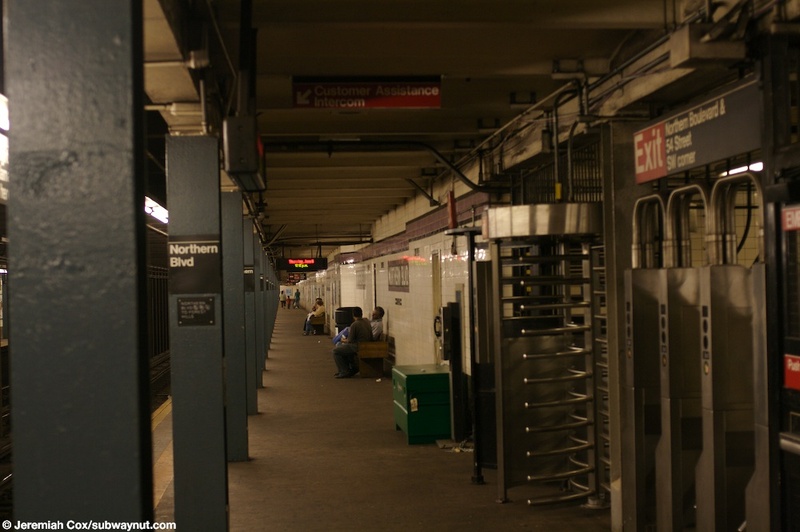 The station has no mezzanine, and in turn no free crossover or under, each platform has its one exit to Northern Blvd at the western most ends of the platform with the turnstiles directly alongside the platform. 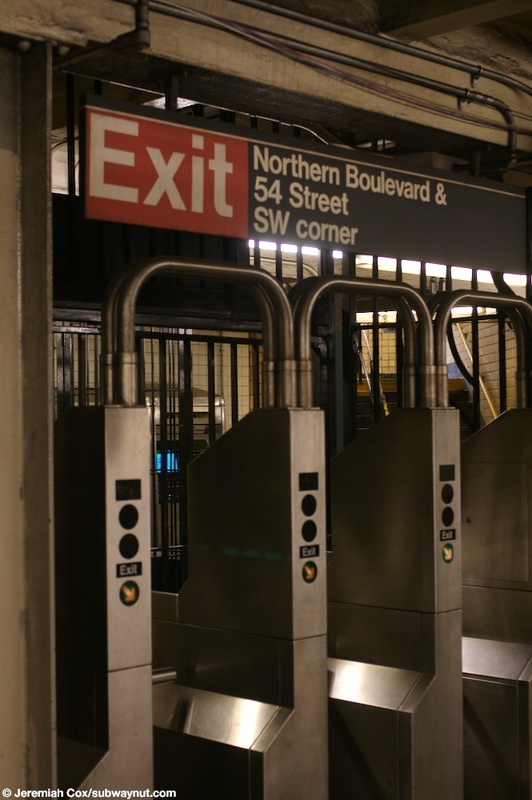 The token booth on the Forest Hills-bound platform was closed even at middays so the turnstiles were closed as well, the only way to enter the Forest Hills-bound platform was via High Entrance/Exit Turnstiles. There is some evidence of a former exit at the western end of the platform, with a portion of the wall that is lacking name tablets and only has the purple line of the trim. 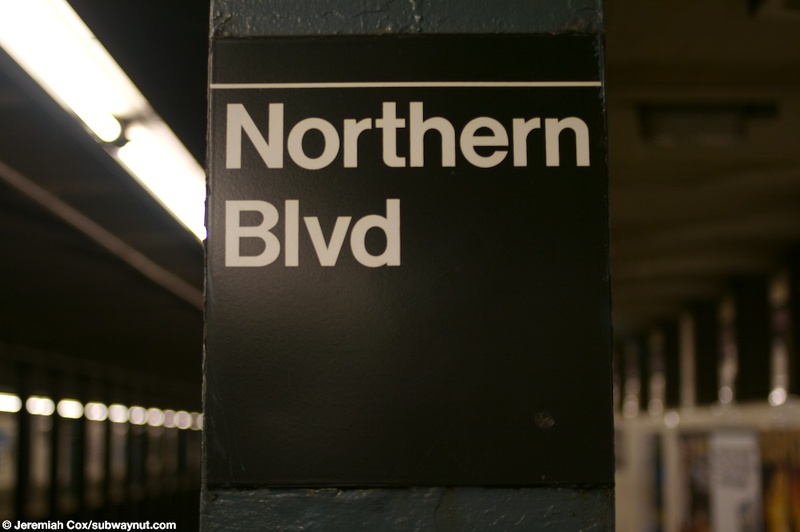 There are still signs for this exit at 56th St underneath some of the name tablets. 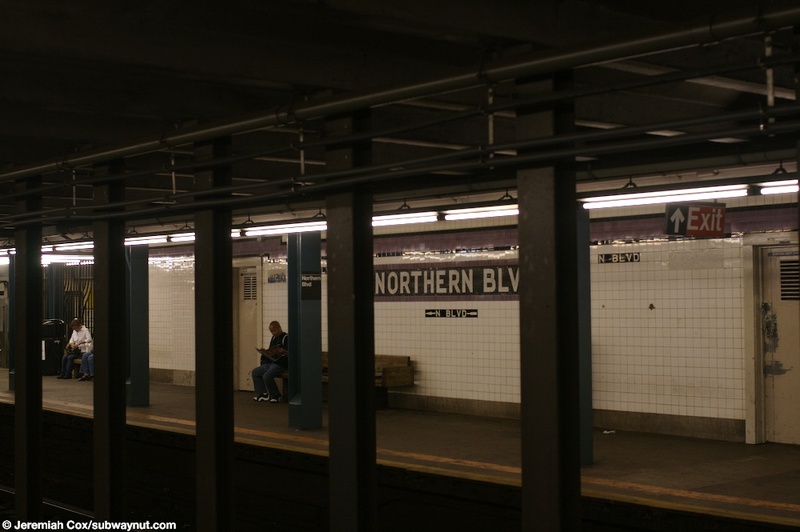 (northernr1) Looking down the platform at Northern Blvd towards a portion of it that is now exitless, a name talbet though still has the number and arrow underneath it directing passengers to 56th St.
5 June, 2008 (northernr2) A name tablet at Nothern Blvd with the directional arrow to N Blvd underneath it. 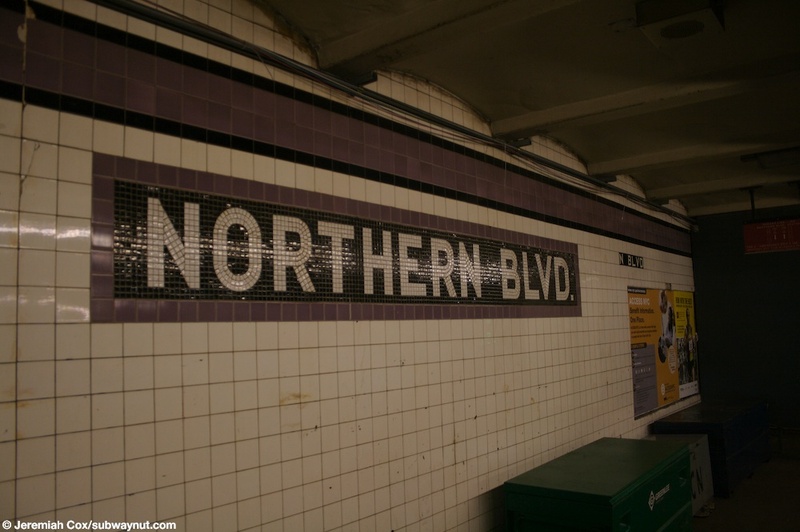 5 June, 2008 (northernr3) The services sign on the Forest Hills-bound track is pretty boring at Northern Blvd. 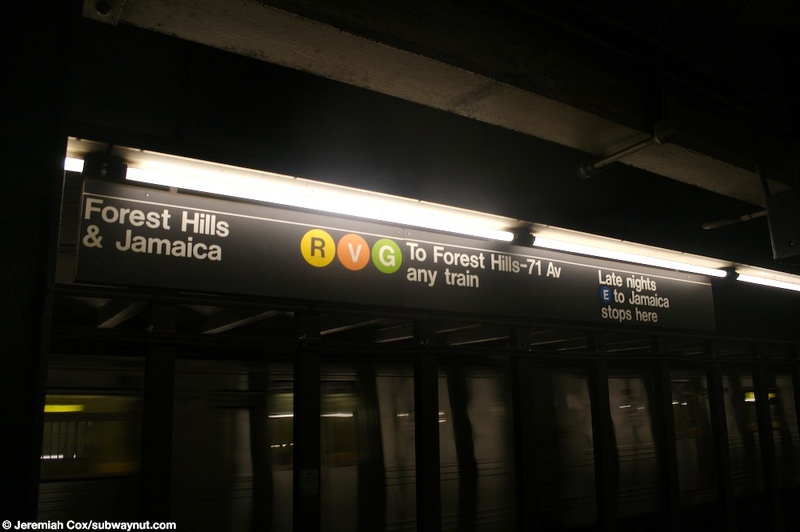 To Forest Hills-71 Av, any train. The E though does get mentioned in Late Nights E to Jamaica stops here. 5 June, 2008 (northernr4) A name tablet at Northern Blvd without any text underneath it for an exit. (northernr5) Looking down the Forest Hills-bound platform at Northern Blvd by the only entrance, the HEETs that are no the only way to access the platform since the turnstiles and token booth seem to be closed. 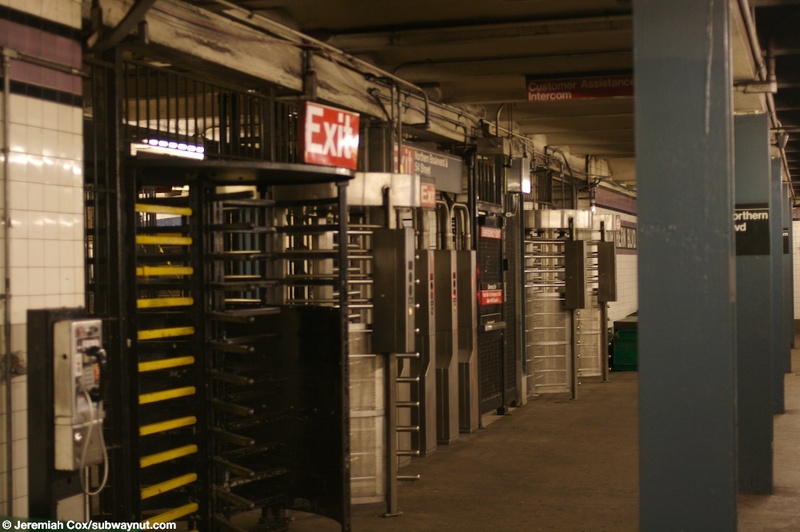 5 June, 2008 (northernr6) The turnstiles that are have a fence beyond them, but haven't been turned off, so the lights say you can still exit at Northern Blvd. 5 June, 2008 (northernr7) A view of fare control on the Forest Hills-bound platform at Nothern Blvd thby an old High Exit Turnstile and the three High Entrance Turnstiles that are the only way to access the platform. 5 June, 2008 (northernr8) Looking accross to the Queens-bound platform with its name tablet visbile. 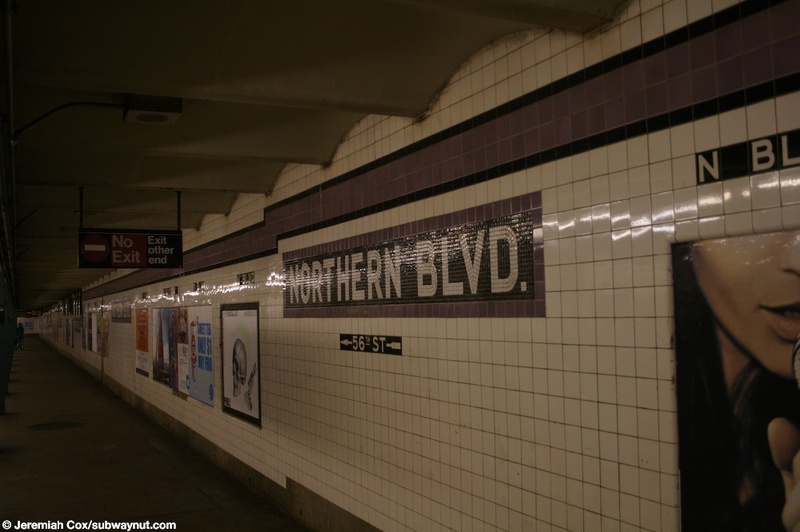 (northernr9) Looking down the Forest Hills-bound platform at Northern Blvd. 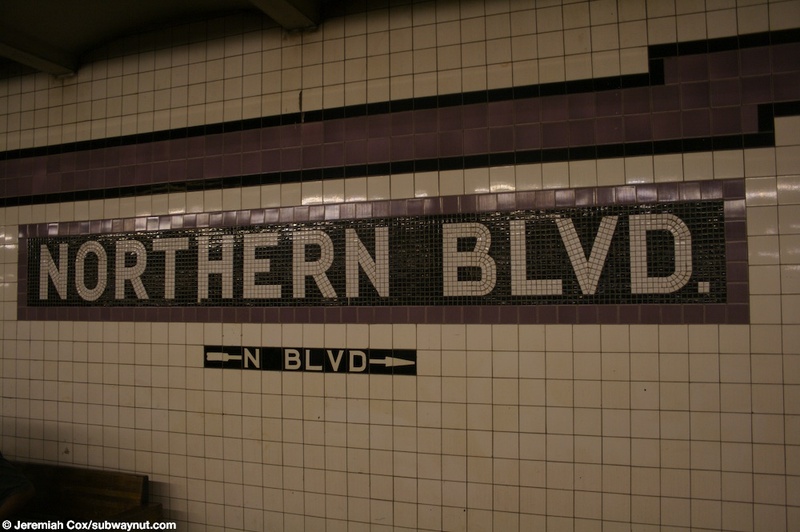 5 June, 2008 (northernr10) A column sign at Northern Blvd. 5 June, 2008 (northernr11) A view down the Forest Hills-bound platform as a R46 R train closes its doors to leave the station.